Three Day Strike by BSNL Workers – A Struggle for justice, a ‘Do or Die struggle’. The Three Days strike by 1.70 lakh of BSNL employees from the midnight of 17th / 18th February 2019 is a fight for survival of BSNL and its workforce. It is a fight for justice to BSNL and its workers. In reality, it is a fight against the anti-worker, anti-people neo-liberalisation policy of the government, intended to liquidate the telecom PSU, BSNL, in order to clear the road for Reliance Jio, the telecom company, owned by the richest person in India, Mukesh Ambani. The proposal to take all measures including closure of BSNL, though later denied by the government, shows to what extend the government has become an open advocate of privatisation and destruction of Public Sector. The story of telecom is not very old. But its growth has been fantastic. The telephones were was introduced in India in the early part of last century as part of the P and T Department. It was monopoly of the government. It was at first manual exchanges, including magneto exchanges.The growth from magneto and central battery exchanges to the modern exchanges was quick and fast. By 1970s, India had one of the largest telecom network in the world. All the latest communication technologies were introduced which enabled the subscriber to call national and international numbers from their own telephones. Till this time due to various reasons, including national interest and secrecy as also the cost of the infrastructure, telecom services were the monopoly of the central government. The modernization of telephone system ensured that this is an area where big money could be made. This was also the period when the USSR, the first Soviet country, collapsed and the world economic order changed from bi-polar to supremacy of the capitalist powers led by US. The central Government also started the Liberalisation, Privatisation, Globalisation (LPG) policy of exploitation of the people. The priority of the public sector was taken away and privatisation of PSUs became the order of the day. How to privatise Telecom was the question before the government. It was not easy to privatise the telecom services being run by the government all of a sudden. The National Telecom Policy (NTP) 1994 allowed entry of private operators for providing telecom services. Licence for providing mobile services were granted to private companies, but denied to the telecom PSU MTNL and DOT. ( When BSNL was formed in 2000, it was also not granted permission to start mobiles services). Mighty strikes were organised against privatisation and corporatisation of telecom services. However in the last moment, the three recognised federations agreed for corporatisation with certain assurances from the government for pension payment by government, regularisation of casual labours etc. (Of course half a dozen unions, including E.III(N) union opposed corporatisation and organised many strikes as mentioned above.) BSNL was formed on 1st October 2000 with many assurances from the government regarding its financial viability, support from USO Fund etc. But within a few years these were stopped one by one. BSNL was making good profit for about 9 years. Denial of mobile services for the first few years, not allowing purchase of required mobile lines, allotment of inferior spectrum, confiscating all the reserve fund available with BSNL in one way or other, Favouring private telecom companies at the expense of BSNL, not filling up of vacancies created by retirement of about two lakh workers, corruption at top level, no initiative by the BSNL management for a long time etc. resulted in incurring loss for the last few years. The anti-PSU policy of the government was the main reason for the loss.The suggestions given by the Forum/Joint Forum/AUAB ( the joint forums of the unions and associations in BSNL) were ignored. Government tried to weaken BSNL through disinvestment, VRS, unbundling of copper cable, formation of Tower Company carving out of BSNL, merger of BSNL and MTNL etc, but the united struggle by the officers and the employees could stop most of these. Modi Government is aggressively privatising /disinvesting PSUs one after another and BSNL is a big target. Reports are coming in the press ( later denied by the government) that all options including closure of BSNL is under consideration. This is a dangerous situation. Such a situation is being created to allow Reliance Jio to take the entire telecom sector and exploit the 100 and more crores of subscribers by increasing the telephone charges, as have happened in many countries. This is not only an issue of the workers, but the issue affecting the entire country. It is against this first and foremost, that the entire telecom workers, including officers, coming to about 1,70,000 are going on a three days strike from 18th to 20th February 2018. 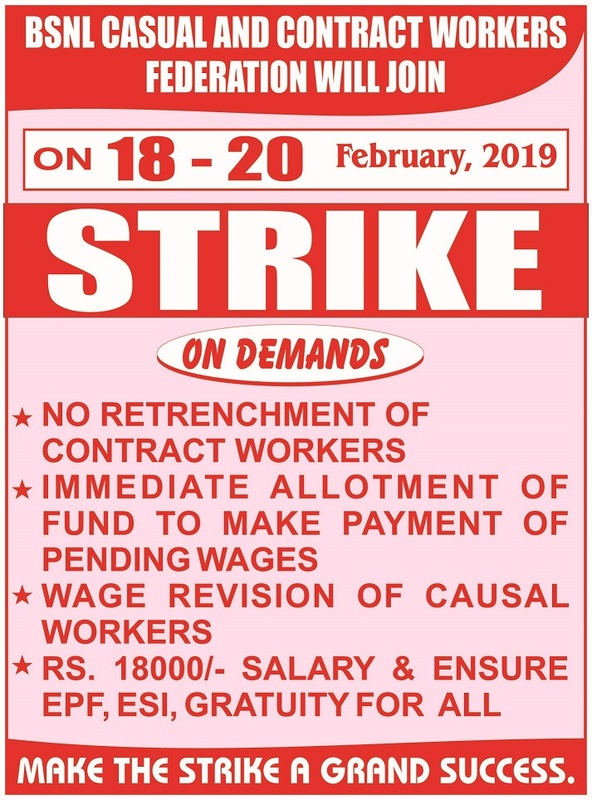 The strike will start in the midnight of 17th/18th February. In addition to the survival and improvement of BSNL, the other demands include allotment of 4G Spectrum to BSNL, Pay revision w.e.f. 01-01-2017, Pension Revision, reduction of pension contribution related to actual pay etc. The one lkh casual contract workers are also going on strike on the same days with the demands of regularisation, minimum wage, against retrenchment, payment of wages in time etc. It is to be noted that these workers have not been paid wages for the last 2 to 8 months in different places. The All India BSNL DOT Pensioners Association (AIBDPA) has extended all support and solidarity to the strike. They will sit in dharna along with the striking workers. The Central Trade Unions have extended their support and solidarity to the strike and demanded the government to concede the just demands of the BSNL workers. Only a few hours are left for the start of the strike. Despite many discussions, due to the adamant stand of the DOT and the BSNL management, the workers are left with no other options other than going on strike. This strike needs the full support of the people. This is a ‘Do or Die’ Strike for both BSNL and its workers! Let us make it a big success!